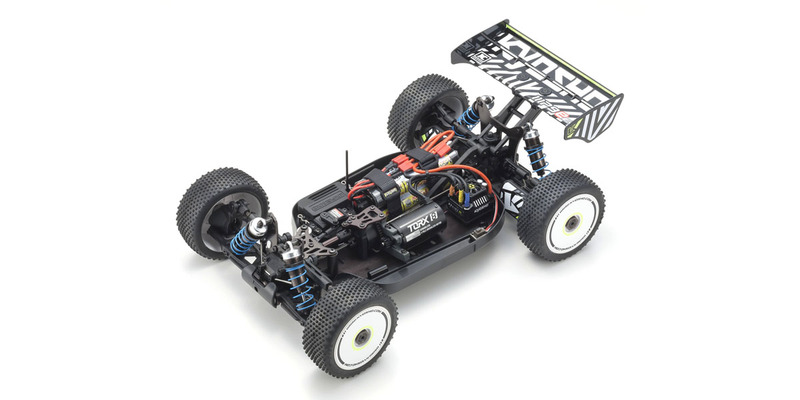 Specialized electric buggy layout with the optimal weight distribution came from the competition model of “Inferno MP9e Evo”. Full time shaft-drive 4WD model, equipped with 2-bevel front/center/rear sealed oil differential. 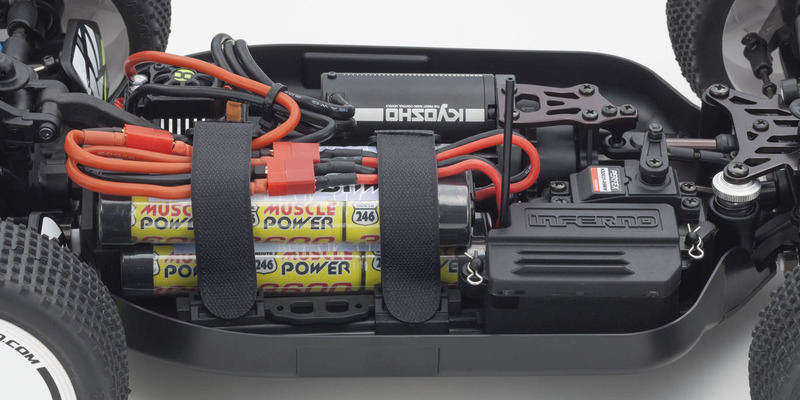 Features KYOSHO SPEED HOUSE 2000KV TORX 8 (waterproof) brushless motor. Dynamic acceleration and power delivers breathtaking off-road performance. 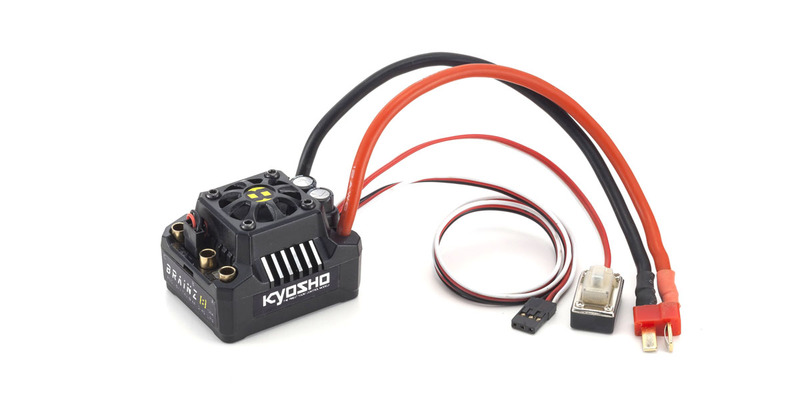 KYOSHO SPEED HOUSE BRAINZ 8 waterproof ESC with electric fan included features adjustable functions such as brake, advance angle, cutoff voltage, heat protection etc. Special mount allows the ESC to be detached efficiently for maintenance. 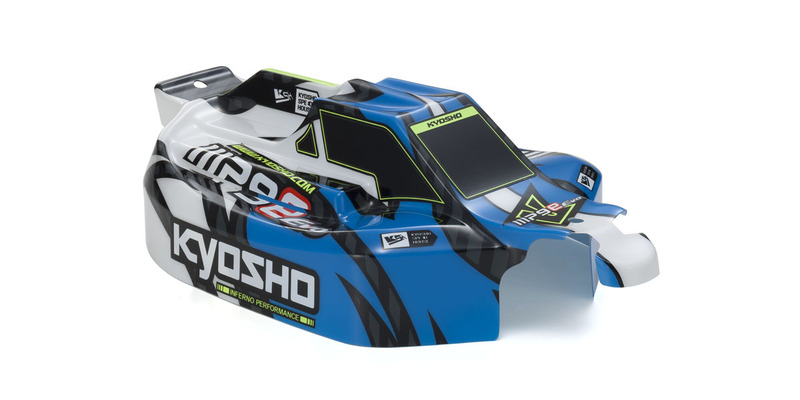 With the same aero body shell as competition kit features center fins and narrowed cabin with a lower center of gravity to deliver dramatically improved running stability. 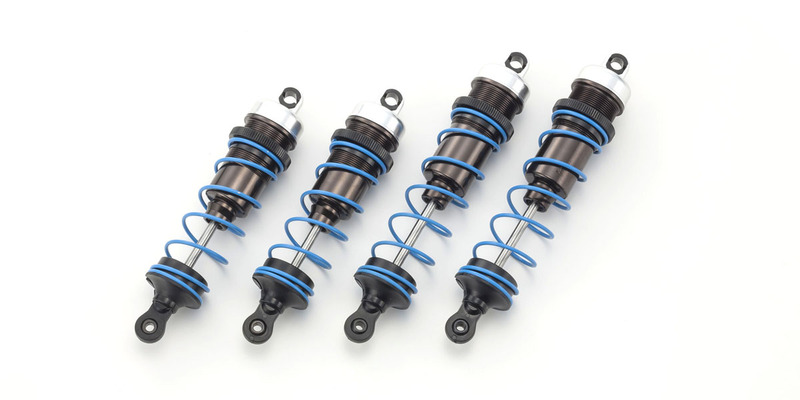 Big bore machined aluminum oil shocks realize excellent shock absorption and rock solid running stability under any driving conditions. 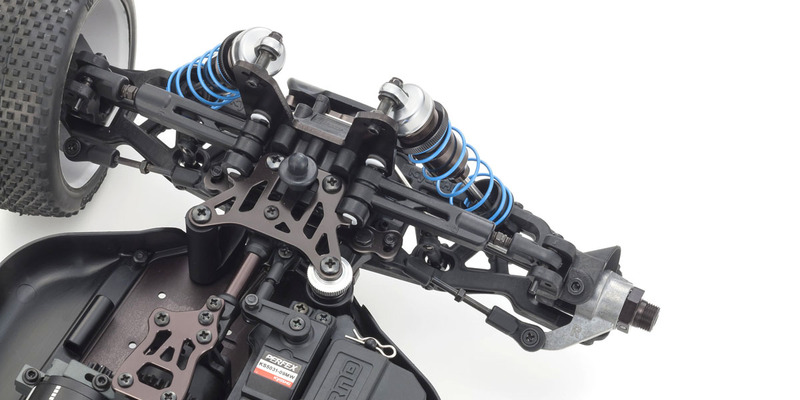 Rib reinforced long front suspension arms from the Inferno TKI4 realize superior steering response. Front hub carriers with wider 17.5° caster angle also contribute to improved running stability. 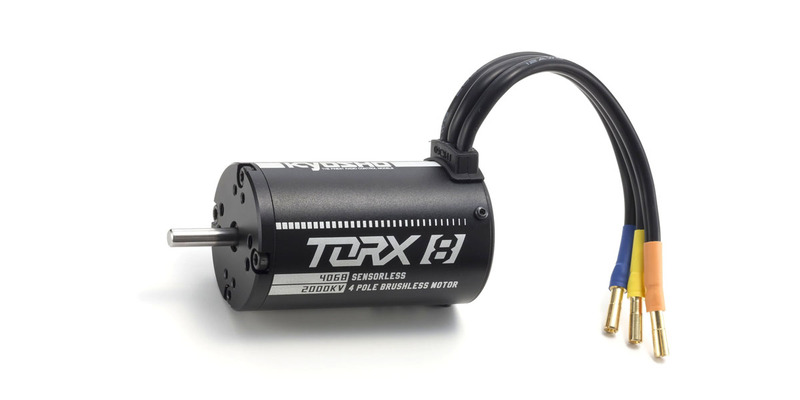 Motor is secured firmly with the sliding motor mount that allows easy backlash adjustment and detachment of the motor by loosening just two screws from above. 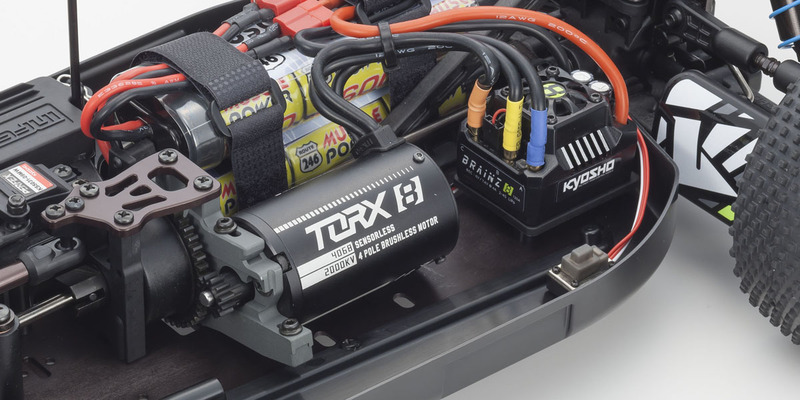 In addition to lower center of gravity from the lower position of the battery, the belt fastening doesn’t affect the chassis flex that contributes to roll and pitch. 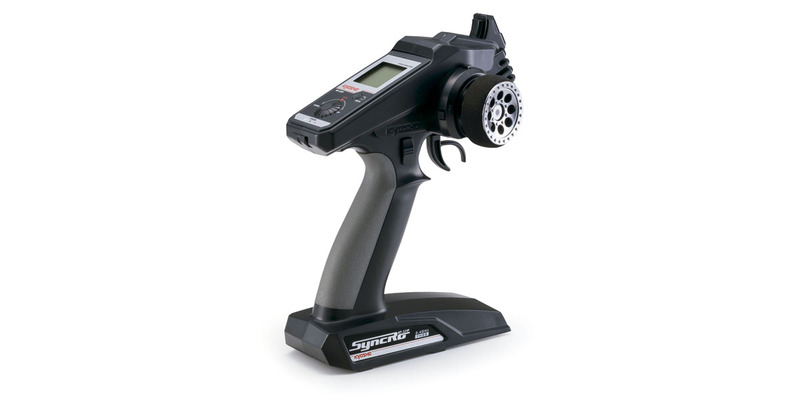 Includes advanced function Syncro KT-331P transmitter that allows easy adjustment of settings with jog dials while viewing the LCD screen.